OH MY GOODNESS. This weekend was one for the books because guess what?! Tony and I are engaged! I can’t wait to tell you all about it soon and explain our entire story. Right now we’re busy celebrating and are SO incredibly happy to continue our adventures and love for one another, forever. What an amazing love story we have. Don’t worry, I promise to fill you in on all the deets soon!! For now, double chocolate banana muffins are on today’s menu and they are FANTASTIC. 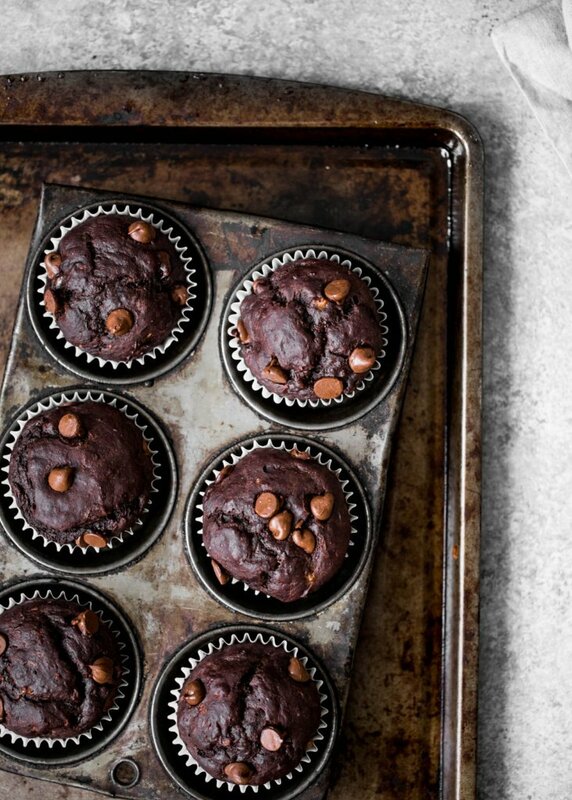 I’m not sure why it took me so long to created a chocolate heavenly flavor of my signature skinny banana muffins, but there’s certainly a story about them. I had a serious dilemma over the weekend and found myself with about 15 bananas in my kitchen. What is one to do with so many bananas? Of course make banana bread, however my 4 year old chef suggested we make muffins instead. Challenge accepted! 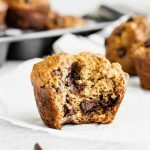 I found myself tapping away on my laptop and not long into my Google search, I found your recipe for Skinny Banana Chocolate Chip Muffins. I was intrigued because it seemed simple, I had most of the ingredients, and I knew my 4 year old chef would be excited. To share quickly about my 4 year old chef. My daughter, Reagan, loves to be in the kitchen. She loves to do anything in the kitchen. Wash dishes, empty the dishwasher, clean up a spill, and of course any kind of baking or cooking. I’ve learned she has a pallet unlike my own. For example, she can taste salt when I cannot recognize it. I knew I had to help her explore her passion. She has motivated me to dedicate Monday mornings to our own ‘cooking class’, which we started a few months ago. While still dressed in our pajamas, we slide our matching aprons, play some music, and get started. I prefer to avoid baking from a box, if I can. I’ll admit some Monday’s I’m not fully prepared, but when I am, I’m always pleasantly surprised at what we can accomplish together. Baking with a 4 year old can be a lot of work, sometimes Jello is all we can manage, and she’s completely delighted with those results. Plus we’ll add freshly whipped cream! This Mom is a rock star in her eyes. But I digress. The Chocolate Chip Banana Muffins were a big hit, and not just for her. I was immediately drawn to your blog. Your interests and passions are similar to my own (almost identical), except you have become more successful and I applaud you! I was scanning through your Pinterest and felt compelled to email you. I don’t normally do that, which I know this is strange. But I wanted to say Thank You for sharing your passion! Thank you for inspiring me to continue making delicious and simple recipes. I’ve already started looking for our recipe for next Monday. I usually post a picture to my facebook album of my daughter on Monday mornings, and would love to include a link to your recipe. Attaching a picture here to share with you. 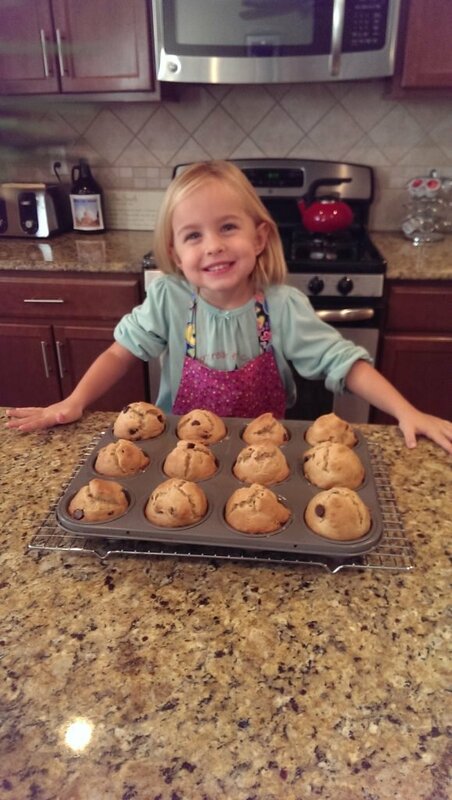 Reagan with the freshly baked Chocolate Chip Banana Muffins. Immediately I knew this darling deserved a special muffin to bake with her mama. And since she just so happened to love the skinny banana muffins so much, I decided to make a chocolate variation, because what kid doesn’t love chocolate? 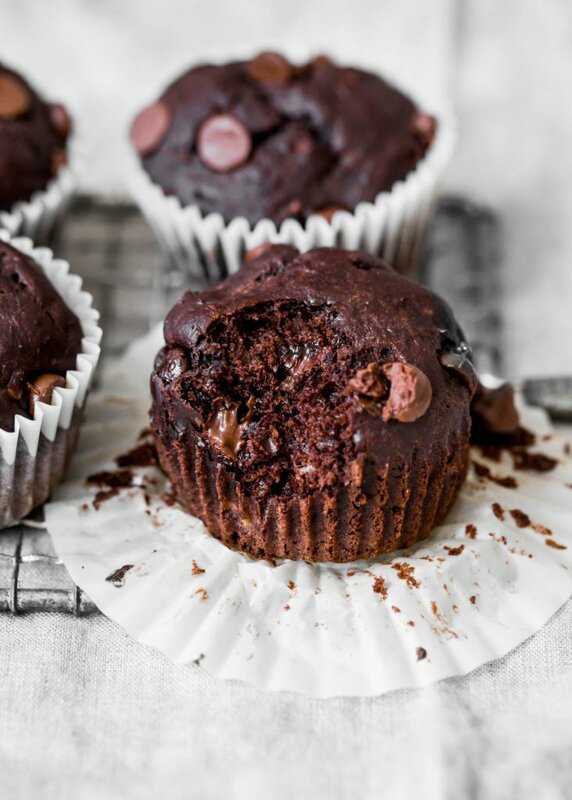 While they are chocolate muffins, they’re made with whole grains, protein packed greek yogurt, naturally sweetened with honey (or maple syrup) and contain just a hint of chocolate sweetness. I call them perfection. I hope you love these muffins as much as we enjoyed them. And Reagan, I hope you enjoy baking these. I love them warm with peanut butter on top. Enjoy! 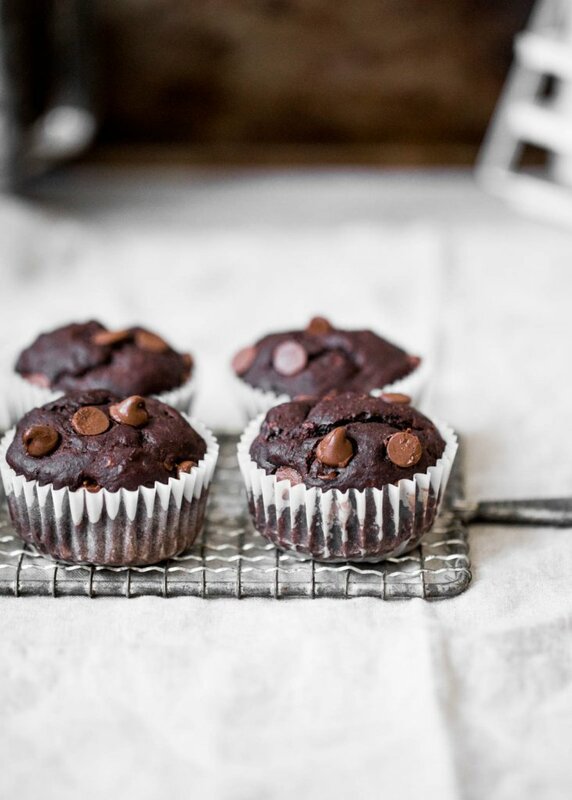 Healthy double chocolate banana muffins made with whole grains and greek yogurt. No added sugar so you can feel good having chocolate for breakfast! Mix wet ingredients together until well combined: ripe bananas, honey, vanilla, egg, oil and greek yogurt. Add dry ingredients to wet ingredients: whole wheat pastry flour, cocoa powder, baking soda and salt. Mix until combined. Stir in 1/3 cup of chocolate chips. Pour batter into greased muffin cups. Sprinkle remaining chocolate chips on top. Bake for 23-27 minutes until tester comes out clean. *You can use a mix of regular whole wheat flour and all purpose, but these are best when made with whole wheat pastry flour. I recommend using 2% plain greek yogurt because it adds a hint of moisture, but you can also use nonfat. 105 Responses to "Skinny Double Chocolate Banana Muffins for Reagan"
Oh my gosh what a sweet story I loved that! She is adorable. I can’t wait to make these. oh and CONGRATULATIONS!!!! 🙂 So amazing Monique best to you and Tony! These look SO delicious (love any chocolate recipe). Reagan is just so adorable! omg yay!! CONGRATS!!!!!!! how exciting and i’m so happy for you! also these muffins look amazing!! i think i’m going to try to make a mini muffin version!!! Congrats on your engagement! How exciting!!! I am so, so happy for you! Although I don’t know you personally you have become an idol for me since I started reading your blog. It’s so good to know that real love can happen in real life and doesn’t exist only in books, songs and films!! Monique, congratulations to you and Tony!! How wonderful! And, these muffins look amazing! Who does not like chocolate chips in their muffins?? Can’t wait to make and try them; what a sweet story! I have some nice, ripe bananas & here I was trying to decide to do with them. Yay! Congrats first of all! This is such exciting news! I’m so happy for you, you were right 2017 is going to be your best year yet. It’s funny because you don’t even know me but I’ve been reading your blog for four or maybe even five years now so of course in my mind we’re friends haha. So I’m Jen, love working out and love eating and I have twin 16 months old boys and a four year old boy who will all one day think I’m a baking goddess because of you. Much love! What a little cutie Reagan is! Also, congrats on the engagement!! This is absolutely perfect timing, as I had bookmarked another one of your regular banana bread recipes for using up my ripe bananas tonight but was a bit torn because I am also craving all things chocolate. can’t wait to see the ring and read the story!! Woohoo!! Congrats on the engagement!! Congratulations on your engagement! And how stinkin cute is Reagan?! Any suggestion on egg and yogurt substitute to make these vegan?? I want to make these for the girls in the office, but one of them is vegan so always a challenge. Thanks for all your recipes! This is a exciting time for you and Tony!! 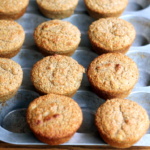 Question…can I make these muffins with gluten free flour? Congrats on the engagement Monique! It really is so cute how you and your fiancé met. My husband has a deep love for baseball. We go to Spring Training in Scottsdale every year, it holds a special place for us as well. Love and baseball, that’s a winning combo! I first got hooked on your site from finding your healthy banana bread on a google search, it’s so delicious and light, I’ve made it a dozen times already. I made Regean’s muffin tonight and they came out superb. You’re right about the Greek yogurt, it gives them a perfect amount of moisture. Thank you so much for all of your recipes! Oh these look amazing!! Can’t wait to try them. Congrats on the engagement!! Made these today! Followed the recipe, they are amazing!! I’ve got to make these! They look delicious! Oh darn! Just got home with the intention of making these and I don’t have enough honey. Can I substitute maple syrup? These were a HUGE hit in my house. Very moist (I used 3% yogurt) and lasted well in Tupperware. Thanks for the he amazing recipes!! I love this blog. How long did they last for you? Did you store them in the fridge or just at room temp? They are so tasty! Could I use 1/4 cup of pure maple syrup instead of honey? 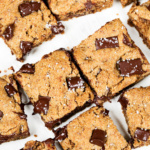 Just tried them today and my extremely picky son loved them…He kept on asking for seconds ..The only thing I changed was that I substituted honey with dark brown sugar ..
Wow! 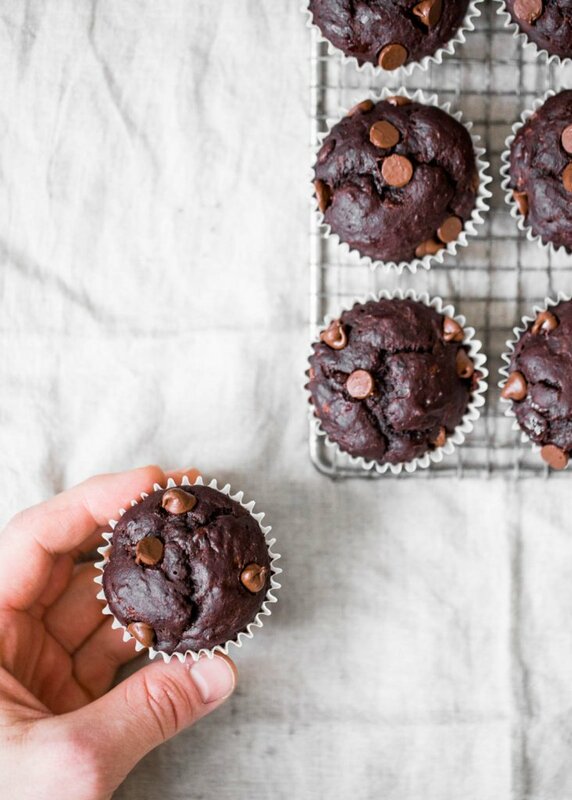 These double chocolate banana muffins look amazing! It makes the perfect snack or even a treat! Awesome work. Hi there! I just came across your blog and think this is great. I wonder if using almond flour and regular light yogurt would change the consistency too much? In last year you talk too much about you love life (it’s constantly about your love Tony – feels too showy)! Please stop oozing on about it, it can be too much and puts single people off on following you!!! Hello! I made these muffins two days ago with a gluten free flour blend (instead of the whole wheat flour) and they turned out beautiful! My 2-year old grandson is a big fan too! 🙂 These are delicious and I plan to make this one of my ‘go to’ sweet treats. Thanks much for the recipe. Can’t wait to try the Banana Pancakes (again, using gluten free flour) for breakfast tomorrow. These are fabulous; however I have one question–what brand of cocoa powder do you recommend. I usually have Nestles or Hershey’s on hand. Is there a substitute that can be used for the yogurt for people who are lactose intoleranr? Hi Sally! You could swap in a non-dairy yogurt (like a coconut yogurt) or a non-dairy milk. I made these for my husband and he loved them. Very chocolatey. Thank you for the wonderful recipe! Can I use just whole wheat flour and whole milk yogurt? Hi! Whole wheat flour will make these a bit dense, so I would recommend using whole wheat pastry flour (or a mix of whole wheat + all-purpose flour). I think whole milk yogurt should work! 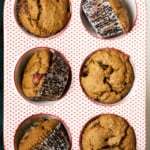 I’ve only made these using whole wheat pastry flour (it has a specific baking consistency) – but try this recipe that calls for gluten free oat flour and can be made into muffins! 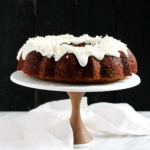 Can i use coconut flour instead of whole wheat pastry flour? Just made these for breakfast! So moist, puffy and delicious! Can’t believe there’s no sugar, whole wheat flour, and I had nonfat yogurt. Family was happy, and house smelled great. Thank you! So happy to hear that! Love these ones 🙂 Enjoy! I wanted to like these, but I though changes to the recipe could have been made. I followed everything to the T and it turns out the ratios don’t match up. I like the muffins have room for improvement especially for a better texture. Very strange! These are one of my most popular muffins (especially for their fluffy texture). I would double check your ratios and make sure you used whole wheat pastry flour! awesome recipe! guilt free and it taste amazing! Thank you! Omg just made these tonight and they are delish! I knew from the batter they would be! 1) how and how long do you store them for? And do these freeze well? 2) I baked mine for 23min as the skewer came out clean but the consistency inside seemed a bit moist almost wet like a gooey brownie. Is that the right consistency? Was light and fluffy though but just a bit gooey. Hi Sam! So glad you enjoyed these! I usually keep them in a Tuppeware container on the counter for about 3-5 days, but you can also store them in fridge for a bit longer. They freeze very well if you’d like to keep them for a couple of months! Hmm it sounds like they could’ve had a couple more minutes in the oven. I would leave them in for a bit longer next time to be sure! Honey is still a sweetener and a carbohydrate and both sugar and honey are fructose and sucrose. Perhaps better than sugar but by no means a health food.That being said, they sound delicious and I will make them. I will use oat flour and green banana flour so they will be flour free. I often substitute them for flour. Makes them gluten free and much healthier. I notice you have used paper liners but recipe says to grease muffin tins. Thank you. Sorry, meant glucose and fructose. You’re right that honey has sugar – I like to use it because it’s an all-natural sugar (rather than a refined sugar). Let me know how those flour substitutes work out for you! And I usually grease the muffin tins and the liners so that the muffins come out easily. Congratulations! 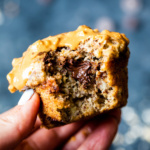 These look so delicious, we always have left over bananas in our house & normally I just make banana bread, but these look way better and I can’t wait to try them out! Thanks for the inspiration, time to get baking. You know it’s a good recipe when you make substitutions and it still comes out wonderful! I reduced the sugar and oil, replacing most of the honey with unsweetened applesauce and one of the tablespoons of oil (coconut) with a little more greek yogurt, and used 1/3 chips in the mix but topped them with walnuts and oats just before baking. I also used a 3:1 white whole wheat to unbleached flour ratio and added a bit of cornstarch along with it. We could barely wait for the muffins to cool before devouring a sample. The texture is light and moist, and although not as sweet as it would have been using all honey, the muffins are a perfect balance for us. Thanks! Hi Monique! Just wondering if I could sub 1/2 the whole wheat pastry flour with chickpea flour? Let me know your thoughts! Thanks! Hi Sana! I haven’t tried it, so I’m not 100% sure how the baking might change. Let me know if you give it a try! Would you change anything for altitude baking? I’m in Colorado at 5,400 ft.
I’m not 100% sure, but this article might be helpful! Yumm! This is the best banana muffin that I’ve tried so far. This is a great recipe for beginners like me. This is the 2nd time I had a baking success story. Whew! It turned out well. I added almonds on top instead of the chocolate chips (also because I forgot to sprinkle the chocolate). These look great! Do you know how to convert to a mini muffin recipe? These are amazing! I made them with nonfat yogurt, half white and half whole wheat flour, and Whole Earth Honey 50 Sweetener, which is a mix of honey and stevia. Since low sugar is a priority for me right now, I skipped the chocolate chips. They got tall round tops and are just delicious, even with these subs. Decadent even. This recipe is a winner! I made these this morning finally. They are super easy to mix together and bake. I used 1/2 black cocoa and 1/2 double dutch dark cocoa. They turned out perfect! They’re so chocolatey and moist. These are delicous! My husband loves them, even though things are often too chocolatey for him. My daughter love them, and she is super picky. AND they are made with healthy ingredients – yay! Thank you for sharing this recipe! These were delicious and has hardly any sugar, love them. Omg these are so amazing. I’m really sensitive to when baked goods taste too “healthy” and these totally did not. So chocolatey and delicious and PMS-approved. My daughter LOVED these and she had no idea banana was in them. I subbed the pastry flour for gluten free all purpose and no issues. I’ll def be making these again ! Thanks!!! These were incredible and my daughter LOVED them! She had no idea bananas were in there! I subbed out the pastry flour for gluten free all purpose and had no issues. Def making these again and prob with some fun add ons! Perfect! Glad that swap worked out for you 🙂 Such a great snack! This is an amazing recipe! My 5 year old son loved it! I tweaked it a bit by adding a fourth banana, and using 3 heaping tablespoons of homemade applesauce instead of oil. I also had no whole wheat pastry flour or Greek yogurt so I used 3/4 cup unbleached wheat flour and 1/4 cup whole wheat flour and low-fat plain yogurt. They are absolutely delicious! I would love to see how almond flour would turn out. I don’t have much experience with it?! Thanks for all the great recipes and congratulations on your engagement! Perfect! 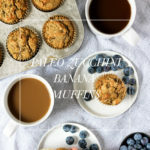 I’m glad you both loved these 🙂 I wouldn’t recommend swapping almond flour in this recipe (the texture will change) but try these muffins instead. These came out delicious! I used Naked Chocolate PB powder for the cocoa for extra protein and substituted organic natural maple syrup for the honey and they are delicious. Love not adding any processed sugar (except for the yummy choc chips 😋), thank you!